Records and visualises a ship’s rolling. Due to the wind and waves every ship will roll once in open waters. 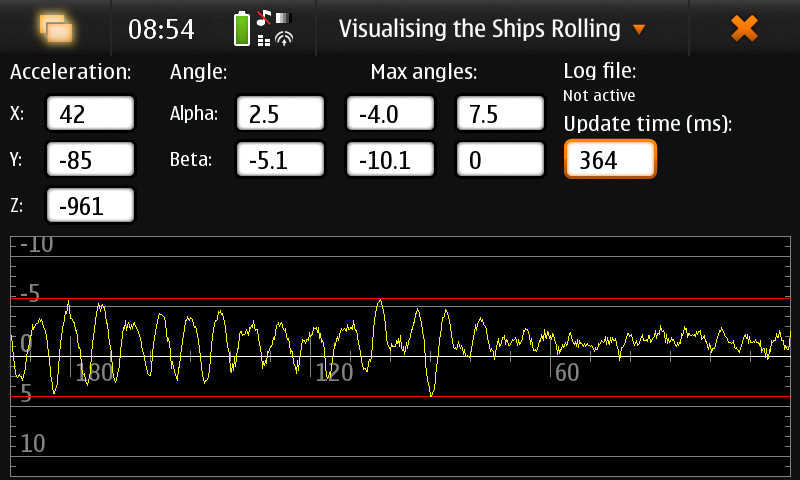 ShipRolling can measure and visualise the rolling of the ship with your N900. N900 or equivalent embedded device with acceleration sensor. For about 2 years I was living on a ship called MV Logos Hope1 with a tonnage of over 12’000 GRT. As the ship often was rolling, I wanted to see if it is possible to record it and to detect a system behind it. Due the wind and waves every ship will roll once in the open waters. My goal was to measure and visualise the rolling of the ship with my N900. 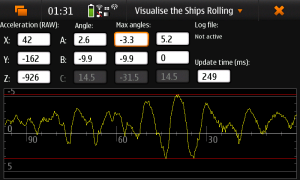 My software can help to show in which frequency and how much the ship rolls. The software measures the acceleration with the built in acceleration sensor. 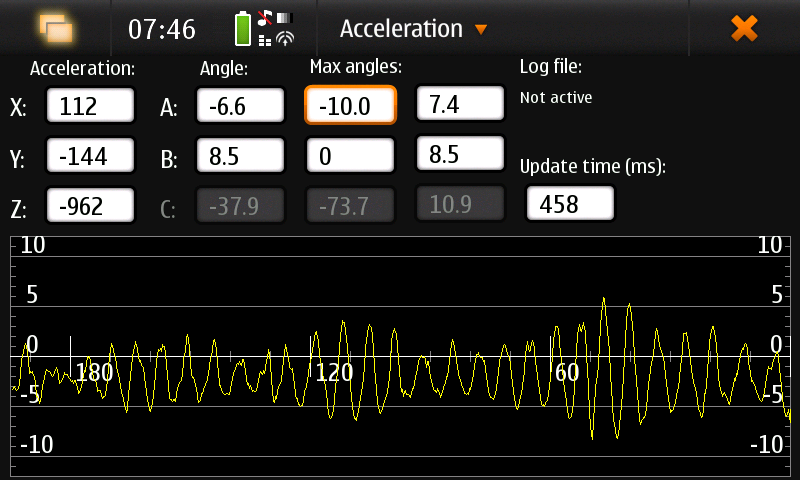 After smoothing, it calculates the resulting angle of the flat lying N900. Beside showing the current angle, it gets also plotted on a graph. For further usage, the data can also be written into a log file. This then can be imported i.e. into MS Excel to generate other graphs and calculations. Above screen shot shows the ship in calm seas. The rolling usually does not exceed 6 degrees. This screen shot shows a bit more rolling (up to 9 degrees). This was in a situation when our stabilizers2 had a fault and stopped working. At 9 degrees lose things can already start moving around on the table or floor. On this screen shot you can see how the stabilizers started to work again after a while. They decrease the rolling rapidly, but also break it into an inharmonious movement. 1: More information about the MV Logos Hope are available under www.gbaships.org. 2: Stabilizers are small fins on each side of the ship under the water line. Like on a airplane, they have flaps which can move up and down. By doing that, they can stabilize the ship and bring a 20 degrees rolling down to 6 degrees. Lay your phone onto a table or the floor. The side with the start button should head forward (the direction the ship is sailing to). The recording and visualizing will automatically start. You can start logging into a 3file through the application menu. The application menu also allows you to reset the graph and the maximum angle indications. Also it is possible to stretch the size of the graph. 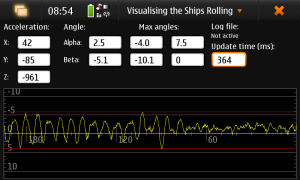 Ship’s Rolling uses the built in acceleration sensor to detect any movement of ship. Those movement are filtered and smoothed to generate a meaningful graph. SleepAnalyser is published under the GPL. Feel free to modify and redistribute. I’d like to conduct a series of tests on a 35 metre trawler to record the roll responses on a time/amplitude basis over a number of conditions. Can you direct me to an affordable source of hardware/software? Any advice would be very welcome. Thank you. Well, I used a Nokia N900 which by now is quite outdated. Alternatively you could look if there is an Android app available doing something similar, i.e. a Seismograph.